3PM: cool, cloudy air all mixed out and some convection over the mountains. Believe it or not, when you see such low visibility it is generally a good sign--an indication of a very shallow saturated layer. 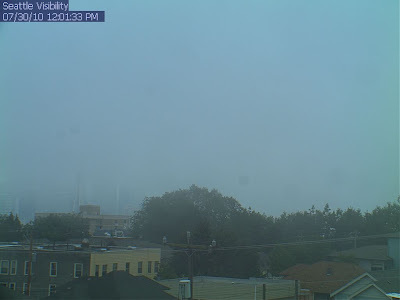 Anyway, the murk rapidly evaporated away during the late morning and temperatures rose very rapidly as the thin cool layer mixed out and was replaced by warmer air aloft. Now this weekend will have its issues, not the least is a considerable potential for rain and thunderstorms on Saturday. The initiator: a sharp upper level trough that will move through during the day (see graphic) and which will cause enough upward motion to get some instability going. 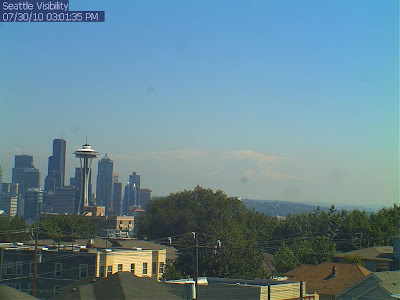 By the way, those in western Washington could have looked eastward and seen some instability clouds (cumulus) over the Cascades later in the afternoon today. Look at the forecast precipitation maps for tomorrow--take your umbrella if you head into eastern Washington and keep a look out if you are planning a hike in the high country. A particular threat in the N. Cascades. Onshore flow is increasing tonight and with that pesky trough in the neighborhood, tomorrow will be a big step down for western WA. Low clouds will reform tonight and they will not give way easily tomorrow...particularly in the central and southern Sound. Yes, perhaps cloudy all day. So what do you do? Stay in the murk in the west? Head to eastern WA and get wet? My recommendation--head for the western slopes of the Cascades. Should be dry, high enough to get out of the low clouds. A good choice...something like Tiger Mountain where you could hike above the low clouds...always fun. Please help researchers evaluate how to communicate weather forecast information. The survey will take you only 20 minutes to complete. Survey data will be used to improve weather forecast products designed for boaters. If you own a boat and would like to participate, please click on the link below. Thank you.